Assalamualaikum and Selamat Hari Raya everyone!! Today is the first day of Hari Raya and I'm so excited to share new products that I have absolutely in love with. A couple of week ago, I received a huge box from Natta Cosme that contains two amazing eyeliners that I don't have to introduce to you guys really. Everybody knows it, everybody owned and everybody love it. It is the Miss Hana Waterproof Gel Eyeliner the Stardust Series. If you do not familiar with this eyeliner like I do, Honestly, this is my first Miss Hana Gel Eyeliner. Lame I know. Miss Hana's eyeliners are waterproof and budgeproof like a bulletproof. It applies creamy on your lids but when it's dry it set. What I mean by set is that, it won't move anywhere at all. These eyeliners are very hot and humid friendly and it is indeed suitable to be wear everyday. Eyeliner can be quite a challenge for my eyelids because I have an oily and slightly hooded eyelids. Sometimes, the eyeliner can easily transferred into my upper lids and that is not cute at all. But with these eyeliners, the nightmare is never happened. I received in two shades which is in Golden Brown and Galaxy Black. First thing first, packaging. I love the packaging. It's pink and it looks classic. Nice. Golden Brown is such a unique color. Don't be fool by the name because this color has a green undertone in it and make it looks like a golden brown-y lavender-ish color. Very nice. The only problem that I found with this color is that it isn't as pigmented as the Galaxy Black and I have to build up several times to get my desire intensity. It is also not as creamy as the other one, but nothing to serious you just have to lightly re apply it or else you will end up tugging your lids. Whilst the Galaxy Black is so pretty. The color is intense and it has silver flecks in it but not as obvious as the Golden Brown has. It is creamy, applies smoothly on my lids and so easy to create wing liner. If you want to build the intensity you have to work fast because when it set, it isn't as creamy as you first time apply it. With the liners on. I decided to create something different with the liners so I created some ombre strokes from the liners. In the inner corner I apply the Golden Brown shade to give a subtle effect and at the ouer corner I apply the Galaxy Black and create a small wing eyeliner. I did the same with the lower lids and bamm look at the definitions and depth that the liners give to me eyes. Loving it! I'm loving these liners so much! I can wear it everyday or when I'm too lazy to apply eye makeup especially to attend 'rumah terbuka'. These liners really accentuate my hazel shaped eyes and I love it so much! If you are interested to purchase this eyeliner it is the right time because Natta Cosme currently having 20% off for Miss Hana Waterproof Gel Eyeliner. All you have to do is simply enter this discount code "MHES 20" to get the discount and enjoy your shopping! 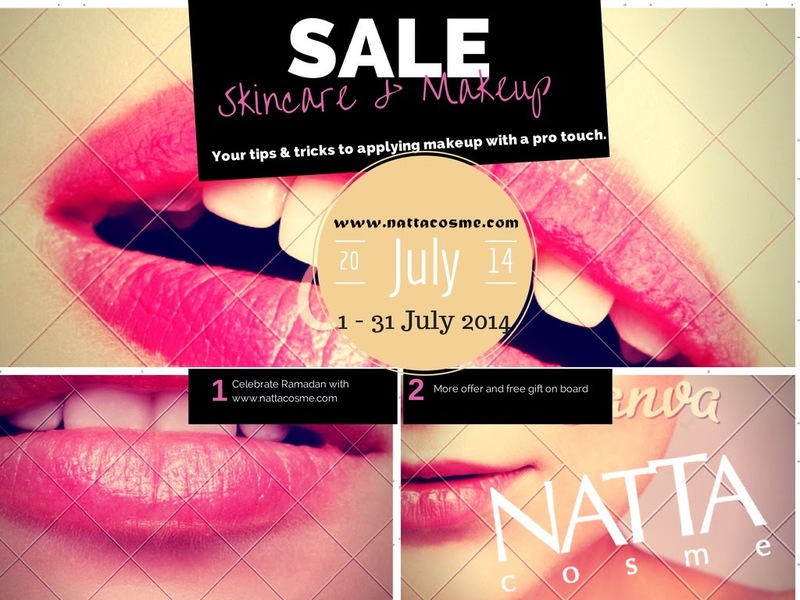 This code is valid until 31 August 2014 so please do shop during the period!! You can save your money a lot.